What is a Geriatric Care Manager? We have compiled a list of local area healthcare links, so you can easily remain in touch with our medical community in times of need. ElderCare Matters Alliance This is your online source for some of America's top elder care experts who can help you plan for and deal with your family's issues of aging. The unique Life LedgerTM is a personal health and information record available anywhere in the world in which there is Internet access. The Life Ledger is a central resource for a broad range of vital information and on-line storage of Advance Directive documents. Serving the counties of Hardee, Highlands, Hillsborough, Manatee, and Polk. 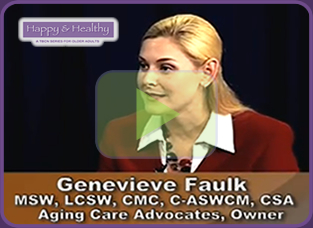 Watch this short video to learn more about Aging Care Advocates. Our team of professional geriatric care managers is available 24 hours a day. What others have to say! Read their full stories here! "I don’t know what my sister and I would have done without the assistance and guidance of our care manager, Jamie. She relieved a mountain of stress from us due to the situation and the uncertainties regarding my mother's diagnosis and trying to deal with a long distance circumstance. Hands down, worth every penny for peace of mind and helping to get my mother to a safe environment." "Mikaela has been an outstanding, caring, wonderful care manager. She is on top of everything, keeps me informed, responds quickly, is professional, personable and supportive. My brother and I are so fortunate to have her. I think your agency is excellent and provides 'the best possible service' with someone like Mikaela. Others too were very helpful -- Teresa, Sarah, Michelle, Jamie, and Jennifer (Hope I included everyone)." "Jamie Cooney has done and outstanding job! She not only has an amazing amount of resources (that I would have never found) but she also handles a rather recalcitrant client with great grace." "I used ACA's services for my parents before they died and recently been attending Amy's support groups as my husband has dementia. My ACA services include a monthly check in call. I feel very good about that and I am aware that I will be needing to rely on Amy's help again in the future, as my husband's care needs increase. Amy is wonderful, kind, helpful, understanding and a wonderful listener." "Jamie Cooney goes above and beyond. To my brother and I she is a godsend, and we are so grateful because things would be totally unmanageable without her. Jamie Cooney built a relationship with my dad and with us, and her professionalism is beyond reproach. I wish everyone was like her, as she is truly a gift. We were over the top with the clinical stuff, and dad would have fallen through the cracks without her. She is on it and follows up in her own sweet way. We wish everyone had someone like Jamie in their pocket. We got your name from a local assisted living facility and picked up the phone and within hours Jamie was there. We are so appreciative. She responds quickly, and we know she has to sleep too. She doesn’t leave anything dangling and she follows up and us keeps in the loop. Dad is very well cared for, and she is part of it." "Thank you for providing so much in a kind and loving manner. Oftentimes, we go through life missing out on meeting wonderful people. Gladly, I did not miss you." "Teresa Jackson worked for me through Aging Care Advocates on and off for two years. She is of exceptional character, reliant, trustworthy, dependable and honest. I had a situation in Florida where, not only did I need a person to check on a family member, I needed Teresa to make phone calls, doctors appointments, house visits, mail pick ups and a number of other tedious chores I couldn't do, due to being in and out of the state. She is thorough and organized and we (my husband and myself) cannot recommend her enough nor give her enough accolades. She saw me through some very rough times with my brother. You will be fortunate to have Teresa in your employ no matter the time frame." "We were told about geriatric care managers and Genevieve after my mother had a mild stroke and we were trying to take care of her needs while living almost 1,000 miles away from her. Genevieve was the answer to our prayers. She is caring, responsible, capable and efficient. She has taken care of everything from visiting my mother regularly to see that her needs were being met to moving her twice into assisted living places (once, close to my mother's then present home and the second time, flying north with her to bring her to a new assisted living place closer to family). She helped to coordinate and get prescriptions for my mother, to get her to doctor's appointments, and even to get her home ready for sale. We could not be happier or more grateful for all the expertise and the able help, support, and wise counsel that Genevieve has given both our family and my mother, and it has always been done with a very enthusiastic, cheerful, positive, and caring attitude. My mother asked many times, "Where did you find Genevieve? She is just wonderful." Genevieve has truly found her niche and loves her work with seniors. We highly recommend her." "Katie W. is a dream come true for our family. My father says she is worth every penny, and my brother and I couldn't agree more. She has not only greatly improved the quality of my father's life, but has numerous times warded off catastrophic medical situations by her ability to advocate for him with doctors, nurses, and various facilities. Because of her specialized training, she does a better job of taking care of his needs than I could even if I were with him full time. Katie W has also improved the quality of the life of his loved ones because we now worry a lot less about my dad; we know she is ensuring that he is getting the care he needs. Dad now has someone "there for him" when the family can't be there." "Dear Genevieve, It is a pleasure to work with you. You and your staff make life a great deal more pleasant for our clients and for my bank colleagues!" "My relationship with Genevieve's team began in 2008, when my mother was hospitalized in Sun City Center, FL. My stepfather was ailing in their Assisted Living Facility. I was a thousand miles away in suburban Washington, DC. I needed a liaison, they needed an advocate, and we all needed a little peace of mind. Enter the care manager, Katie Williams. Katie was referred to us by personnel of the ALF, and she hasn't slowed down yet! I really don't know what I would do without her. Neither my mother nor stepfather can really relate to what they are going through. Katie can. She and her colleagues, brought in from time to time, have helped with medical questions, financial problems and legal situations that have arisen. Genevieve's staff has relayed mail, messages, problems and solutions between my end of the family and theirs, during all those times when I just cannot be in Florida to do what I can, myself. Without her team, we'd be floundering. They've proven to be the best life raft we ever could have hoped for during difficult times in a stormy sea. Thank you for all you do." "Aging Care Advocates has been a lifeline for my family. Our geriatric care manager, Heidi Crockett, is caring, kind, professional, and has a wealth of knowledge. She has been extremely helpful during the process of finding a memory care facility for my Mother and helping us through such a difficult time. Living out of state makes very hard to be hands-on, but having Heidi available in-state puts us at ease. I don't know what we would do without the continued guidance and support." "Several years ago, I found Genevieve's Geriatric Consultants through a Google search on my laptop. I was looking for help in dealing with elder care issues that were beginning to arise with my mother. As I do not live in the Tampa area, it seemed wise for me to have a local advocate and advisor. Her team has been just that, and much more. My initial contact with Genevieve's staff was for research and groundwork on assisted living facilities. They were quite helpful in explaining the complex and confusing options that were available. Recommendations were also made in an effort to extend mom's ability to live independently. Last year, mom fell and broke her hip. Again, I called in Genevieve's consultants for help. After meeting with Katie Williams, I asked her to assist me in doing what is right and best for my mother. Through all of the gut wrenching days of hospital stays, rehab, family pressures, financial restrictions, etc...Katie and the rest of the team were right with me, advising calmly and answering all of my questions and requests. They helped in steering mom through her immediate crisis, and toward a long term resolution to the dramatic changes in her life. When I was not in town, the care manager filled in for me by advocating for my mother, and reporting back to me in an objective way. The service provided by Genevieve's Geriatric Consultants has been an immense help to me and my family. We will continue our relationship with them, and would recommend their services to anyone who needs help in navigating the complicated issues of elder care." "I believe that establishing a professional connection with Genevieve and her staff of care managers made a distinct and significant improvement in the quality and dignity of my father's life. He benefited from having a personal and caring connection with a dependable non-family advocate. His care manager and team became a private lifeline for him when the challenges and frustrations of advanced aging were overwhelming. Having the telephone number for "his team" empowered and comforted him. You became Dad's go-to person when he was frightened or uncomfortable with his medical or living condition; having your number in his pocket diminished his feelings of helplessness. As for me, you became my professional sounding board and "co-strategist" in adapting my father's living conditions to fit his ever-changing needs. Your patient listening, advice and on-site availability were invaluable. I came to depend upon your calm, experienced, big-picture outlook when my fear or impatience compromised my ability to advocate effectively for my father. My brother and I felt extremely fortunate that when we could not be with Dad, you were a regular presence in his life, our eyes and ears. I will be forever grateful that the warmth and grace you bring to the practice of your profession touched my family. We cannot thank you enough. Please also convey my appreciation to the entire care management team. Their patience and professionalism were such that I have already recommended your services enthusiastically to others and will continue to do so. Your employees were unfailingly helpful and cooperative during a year when our family was so challenged and stressed. With gratitude and fondness." "Aging Care Advocates is our preferred provider of geriatric care management services! We have had a relationship for over the past ten years and trust the compassion, professionalism, and commitment they demonstrate client after client. Thank you greatly!!" "Aging Care Advocates provides options, resources and guidance to both my residents and their families. I can personally recommend their services. The staff is a true advocate for your loved one." "Dear Amy, I wanted to send a personal note to thank you for your frequent and loving care you gave my mom. Even though she could not express herself, I know that she enjoyed your regular visits. And I don't know what I could have done without you being there to advocate for her. It was such a relief knowing that you and everyone else at Aging Care Advocates was available to answer questions, follow up on concerns and support me as I struggled from afar, to care for both my dad and mom. It's been a really difficult year and a half (gosh, it seems like it has been so much longer than that). I will always remember your kindness and patience and be grateful for all you did." "My family and I are very pleased and satisfied with the services we have received for my elderly mother. We are all sleeping better at night, knowing that she is in such good and capable hands. We recommend you highly!" "Thank you so much for ALL of your help and concern during this trying time. I was so impressed by your plan of action from my first call to Venus and her compassion until today, with Jamie M's placement assistance, and with guidance from Genevieve. We received absolutely no help from the facility where my mother-in-law was being displaced from, who only gave us stumbling blocks. Jamie you have gone above and beyond what we could ever have done and your patience has been remarkable. You all have been "Angels of Mercy"! A phrase that my mother-in-law used to say for a job well done, "Orchids to You!" "Katie Williams has been raved about by two friends whose father's were served by Katie. Since that time, I've unreservedly referred Aging Care Advocates to people I encounter who are seeking quality care for people they love." "It is a great asset to have all the services offered for the families and seniors I work with. Aging Care Advocates offers peace of mind for both local and long distance families." "I just want to take a moment to thank Jamie M and Katie for all they've done for my family, and my parents in particular, over the past three years. Since I live and work in the DC area, and my parents are in Tampa, I can't always take care of issues with doctors, the assisted living facility, and insurance companies that need to be seen to. Jamie M and Katie have always been there, at any time, on any day, to step in and help out. They advocate for me and for my parents, and are non-judgmental and accepting of any limitations we may have. My parents love them both and look forward to their visits. Thank you for all you do!" "Jamie C is the greatest! She is a lifeline in caring for my mom! Jamie C is smart, dependable & does a great job." "If you are in need of services provided by a Geriatric Care Manager, Aging Care Advocates has a wonderful, caring, knowledgeable and professional team. Genevieve and her team are absolutely awesome!"